Is it really a hot spot, or maybe something else? Is it really a hot spot, or something else? (Understand your vet). Medical terminology can be very confusing, especially when many terms are misunderstood or used incorrectly. Let's talk for a moment about some terms we've all heard if we've ever taken our pet to the vet for a skin issue. First, the basics: There are "diseases" with names and there are "symptoms" with names. It's extremely important to understand the difference when you are having a discussion with your vet. Diseases are often diagnosed according to the symptoms (a symptom is just what you can see or detect with your other senses) that are expressed on or in the pet. The trouble is, both symptoms and diseases have technical names, which can be confusing to the pet parent. For example, "Alopecia X" is often given as a diagnosis of disease when actually it's just the Greek name of the symptoms expressed, i.e., black skin with hair loss for unknown reasons. So, when you take your dog to the vet and tell her that your furkid has lost all its hair and his skin is turning black, and they tell you it's Alopecia, they haven't told you anything you didn't already know. Further, the symptoms of this disease are hair loss and black skin, sometimes accompanied by seborrhea, a disease where the hair follicles excrete excess sebum (a natural oil) that goes rancid and stinks. So still you don't know anything new, you haven't been told what causes these symptoms and your vet bill is getting larger. You knew all the symptoms before you went to the vet, but you still don't know how to fix it. Well, neither does your vet, but that won't stop them from prescribing antibiotics, antihistamines and/or steroids to manage the symptoms. Meanwhile, the cause of this problem goes untreated and your pet's immune system will suffer from this onslaught of drugs, further exacerbating the condition. One of the most common medical complaints in dogs and cats is the familiar hot spot (also called "acute moist dermatitis" among other names). A "hot spot" is another symptom, not a disease. It's caused by something, an infection (bacterial or fungal) or some other kind of irritation (bug bite or thorn or small cut, for example). A hot spot is not a warm place, a reddish skin irritation, or a rash. 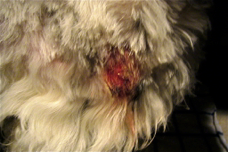 A hot spot is a place where your pet has literally chewed the fur and skin right off, leaving an open, oozy wound that won't heal. Whatever caused it may never be known, but the likelihood of an infection is high, so the vet will probably prescribe antibiotics. However, where vets often make a mistake is in not actually testing to determine what kind of infection is there... With hot spots, often the infection is fungal, not bacterial, and if antibiotics are given when fungus is present, the fungus will bloom and grow and the hot spot will get worse. Any time we hear a pet parent say, "My dog has hot spots," we know that it's probably not "acute moist dermatitis," but rather a rash or red, itchy areas, often at the base of the tail or on the belly or chest. These latter conditions are something else, usually caused by a systemic yeast infection, and if not treated could quickly become a hot spot! 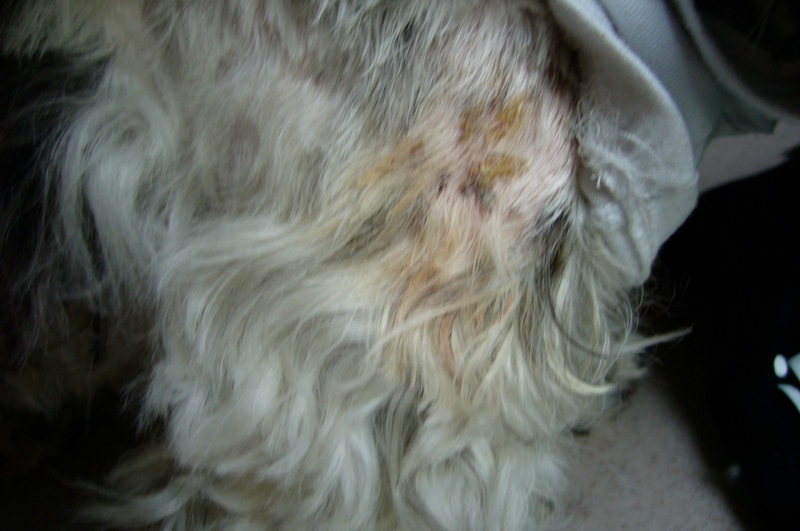 But basically, hot spots appear one at a time, take a very long time to heal and are difficult to treat. And most people think their dogs have hot spots when they really have a simple yeast infection that hasn't been properly diagnosed. Fortunately, if you do encounter an actual hot spot on your pet, there's help! We created our Hot Spot Salve for this purpose, to be dabbed gently on top of the wound and then left alone to kill bacteria and fungus (yeast) and to scab over and begin to heal. The photo below is Skoshi's hot spot two days after a single application of Hot Spot Salve, now with a hard scab appearing and no itching! For all other purposes, rashes, itchy places, yeast infections, black skin disease, seborrhea, "dermatitis" (another disease name that is really the name of a symptom, and all it means is "irritation of the skin"), please use our Skin Rescue Lotion, a spreadable lotion that penetrates and absorbs into the skin to fight the actual cause of the symptoms, rather than just mask the symptoms. The Hot Spot Salve and the Skin Rescue Lotion have the same ingredients but are formulated for different purposes. Be sure you have an informed conversation with your vet if you take your pet in for skin problems. Know the difference between a disease, asymptom, and a cause. Ask questions, insist on tests for specific bacteria before accepting antibiotics, and do not accept steroids (prednisone, or any other medication than ends in "-one") except as a last possible resort. And most of all, please understand that almost everyone who talks about their pet's "hot spots" is misusing the term. A hot spot occurs in one place at a time, is persistent, is extremely itchy and painful, and is usually seen on the foot or lower leg where the dog has chewed a hole in himself. Your friendly pet supply shop salespeople will be better able to help you if you know your terms! And as always, let us know if you have any further questions about this article or about any of our products.